Pope Francis was targeted for not allowing his worshippers to kiss his Papal ring during a visit at the Italian pilgrimage site dedicated to the Virgin Mary at Loreto. The viral video quickly made headlines and sparked debates among people, who began to speculate several conclusions behind the Pope's act of repeatedly withdrawing his hands. But nearly two days after the incident, the Pope's recent gesture seems to end all the controversies. He reportedly allowed his faithful to kiss his ring during his weekly audience in St. Peter's Square. Pope Francis Does Not Want Anyone to Kiss His Papal Ring. On March 27, Pope Francis allowed nuns and priests to kiss his hand during his address to the general audience. According to media reports, one of them was Sister Maria Concetta Esu, an 85-year-old nun who has helped the pregnant women in the Central African Republic to deliver babies for almost 60 years. After according her with the honour, the Pope said it is a sign of the church's "affection and gratitude for all the work you have done in the midst of our African brothers and sisters, in the service of life, of children, of mothers, of families," as quoted by the Associated Press. 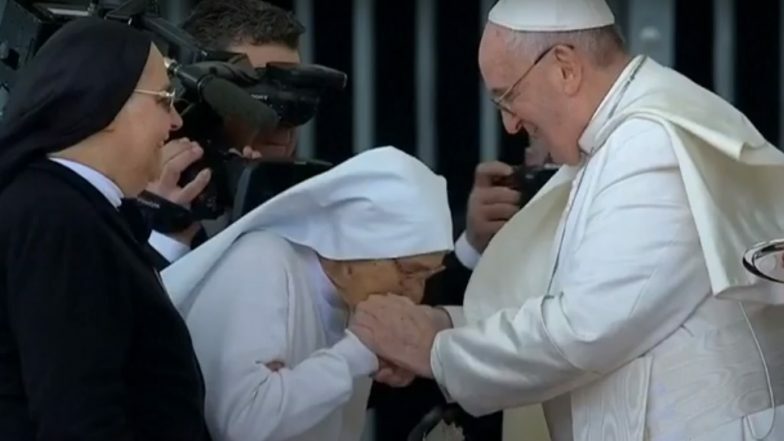 Sister Maria was captured kissing the Pope's ring in respect and honour while he bestowed the award. Meanwhile, the old viral video of the Pope withdrawing his hands from worshippers invited conservative critics who claimed that Francis is abandoning church doctrine and tradition. While the video clip also became material for jokes, many came to his defence noting that he still had to greet sick people and lead a prayer. They further argued that a short clip did not give the full picture to come to any conclusion.